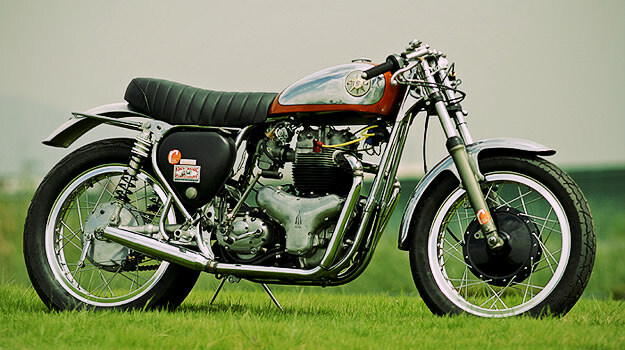 Here’s a classic example of a very tasteful ‘resto-mod’, and one that shows off the lines of the BSA A10 beautifully. The iconic A10 first appeared as the 1949 Golden Flash, but by the mid 50s, the range needed an overhaul. 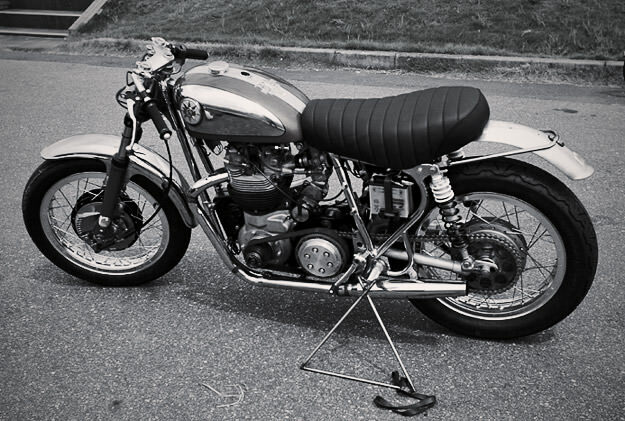 BSAs were being seen as rugged and reliable, while Triumph and Norton fought the performance war. So BSA upgraded its mainstay platform to produce the Road Rocket, and then in 1957, revealed the even faster Super Rocket. The top end of the A10 engine was reworked, and a large Amal TT racing carburettor fitted. The result was impressive: a top speed of around 112 mph (180 kph), with the quarter mile coming up in a whisker over 14 seconds. The pictured Super Rocket is 1960 model from the top Japanese workshop Ritmo Sereno: they’ve bored out the 646 cc air cooled twin to 683 cc, balanced the conrods and crankshaft, and fitted a Boyer ignition and new exhaust system. Ritmo also upgraded the brakes—still drums for authenticity—and fitted RK Excel wheels shod with Dunlop K300GP tires. All they need to do now is fit a headlight, and the bike’s ready to roll.